I was really looking forward to attending my first appointment because I really wanted to see what the dentist thought of my progress. As I had been inspecting my teeth intently in the mirror each day, it had become difficult to figure out whether there had been a big change or not. I knew there had been movement because I could tell that the tooth next to my large front tooth wasn’t so far behind it and had moved out next to it more but I was also a bit concerned that there hadn’t been enough pain. I figured that for my teeth to be moving there should be pain and and I was yet to experience that. So off I went to my visit with my 3 year old son in tow and quickly set him up in the corner chair with his ipad and snacks. Everyone at Oracle was really friendly about me bringing him which was great. First Melanie took a quick look and then took some more photos (I am beginning to feel like a tooth model!) before quickly removing the bands then the top and bottom wires. Melanie commented that my teeth had moved and showed me the moulds of my teeth that she had taken for comparison. It was quite strange looking at my teeth in mould form but it was really great to see the noticeable difference only 4 weeks had made. She then inserted the new wire, cut it to size and began putting the new bands on. The new wire felt a little tighter (maybe heavier?) but not painful at all. Melanie reminded me again that the catalyst for my skewed front teeth was a turned tooth on the left hand side of my mouth and explained that she wanted to do a ligature to give the tooth some extra help turning. She told me that she would use tooth coloured wire but it would add a little more bulk and most likely would cause some more pain. This made me a bit concerned but I was all for getting my teeth to turn and move as quickly as possible. I felt some pressure on my tooth and some twisting and then the clear bands added around the brackets again before it was all over and I was allowed to see. When I took a look in the mirror I was pleasantly surprised. 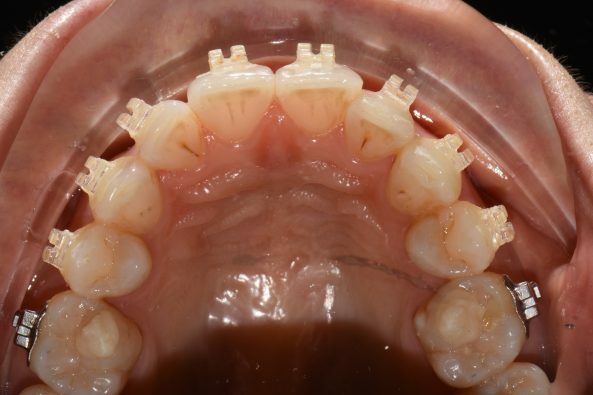 The ligature was hardly noticeable and blended in with the rest of the braces easily. The whole process took about 45 minutes including me asking a heap of (probably annoying) questions. Mostly I wanted to know when I could expect the process to be completed and of course they couldn’t answer this but could only confirm that things were looking good so far but most treatment times are 6 months long. Over the following 4 weeks I had very little pain again but noticed that tooth that had the ligature turning – hooray! After a few weeks the ligature wire started sticking out after I brushed my teeth in the morning which was annoying but a quick phone call confirmed that I should just use pressure to put it back into place and all was rectified. So far time has gone extremely quickly! My family and friends have been really positive about the changes and I am getting really confident about my braces knowing how quickly the changes are happening. One of the best Dentists servicing on Gold Coast!